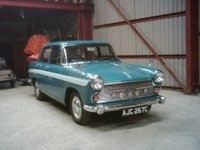 A 1965 Austin A60 with a genuine 45,000 miles on the clock. Bought new by a man from Caernarfon. He died in 1979, but his daughter kept the car in the garage until 1997 when she sold the car to a local man who recommissioned the car including an engine overhaul, brakes etc finaly mot'd. He was allowed to keep the car in the garage by the daughter which was elderly by now. The car then stood again untill 2005 when the lady died. The car was again mot'd. but the owner wanted to sell by now. 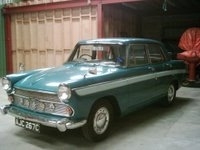 We bought it 6 weeks ago and I use it to travel to work after fitting a new water pump and a good general service. Also have sprayed underside with waxoil as the body is very sound but needs some cosmetic work on the body due to water dripping in the garage creating rust spots. Also needs a respray as paint is fading. The rear bumper needs replacing again due to condensation. Interior is excellent and leather has cleaned up well. The valve radio works after warming up for a couple of minites, but on medium and long wave. Not good news up here in the hills. We plan to sort the body this winter. I am now renovating the body on our 1965 A60 over the winter months and I am looking for a good rear bumper or just the rear driver side would do. 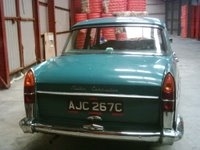 I am also looking for a good chrome strip which goes across the boot lid. So October had arrived, and the evenings were getting shorter so no excuse for not getting stuck into the A60. I started off by giving the car a good clean with a pressure wash including the engine bay and the underside. All the chrome, door handles, lights etc were striped off. Rivets holding the circular clips holding trims were drilled out and clips kept safely. All items labelled and kept inside car. The ‘S’ sections in the grill/ wing were fabricated and welded on with a mig. As well as a section under front o/s headlamp. 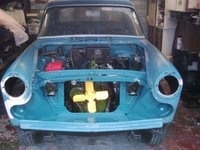 3ins square sections welded in where front wings meet the valance. The o/s boot guttering had some corrosion, so I cut it out and fabricated sections. Had to remove the boot lid to cut the metal and had to put it back on to get the final measurements and finishing. I had intended to leave the engine bay as it was as it had been painted by the previous owner. 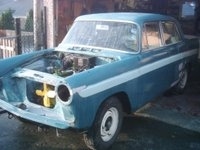 But it was in a non standard colour with some runs, and the engine was in the wrong shade of green. So off came the dynamo, cut out, fuses, wiper motor radiator etc and I rubbed the paint down to original with 240 grade wet emery. Without taking the engine out it would be very difficult to spray the compartment with a spray gun, so I used an aerosol can of zinc primer to cover what I could. 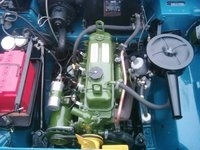 Then using Auto paint synthetic in Persian blue slightly thinned I brush painted the whole engine compartment. Let it dry for a week and then giving it another coat. Then painting the engine with bmc green engine paint. And of course painting the radiator and horns black. I then rubbed the whole car down with wet emery, and that is when I came across many dents and scratches of various types and sizes and of course previous work that had been done. There were some damaged paint spots on the boot lid and on the top parts of rear wings thru water drips when in storage so I completely removed the paint off the outer boot lid with paint stripper, and rubbed the rear wings to bare metal and found no damage to the metal itself. Due to the lack of space in our garage I decided to spray the boot and bonnet at my place of work. The doors at a neighbour’s garage and do the car at our home garage. 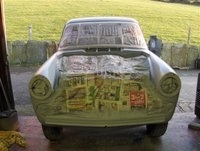 It took hrs to mask the whole car. 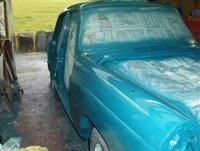 Then the whole car was sprayed in cellulose primer filler. And after rubbing down was sprayed in cellulose ‘Persian blue’, with the stripe in ‘snowberry white’. 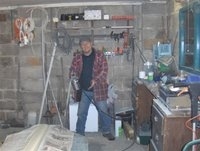 The process was again repeated for the doors in our neighbour’s garage, and the boot and bonnet at work. The ventilation was improvised by tying my wife’s fan (from the house) onto the open window and using the high speed. It worked a treat with no known complaints from neighbours. Being a plant and lorry mechanic I don’t claim to be an ace sprayer, but I get by mostly with luck and some second chances. But it the finished result was good. I used 4.5 litres of the Persian blue. Luckily I bought 5 litres in October 2006 as cellulose in not supplied any more by most motor factors (you know environmental and all that). As the car has only done 45000 odd miles and has been standing for many years in a dark garage the interior was in good order. The seats came up a treat with a good wash and some leather treatment. I removed the original valve radio and fitted a more modern one as it reminded me of the crap radios I used to have in the 1970’s. The car is now back on the road so we are going to enjoy using it and have been to some classic car shows already this year. It is very comfortable car to travel in and it has amazing interior space. 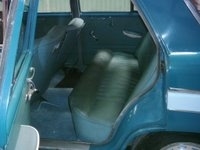 It has more leg room in the back than our Volvo 940. And importantly the wife likes it and has given her approval. 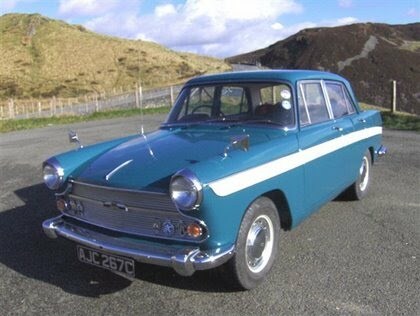 My first car of which I passed my driving test in 1975 was a 1959 Austin A55 mk2 in Grampian grey. Reg no was SFX 92 which would be worth something now. Being 18 and finding it a bit lethargic I changed the 1500cc engine for a 1622cc Riley 4/72 unit with the twin carbs which made it really shift. It has probably been recycled into something else by now. I often wonder into what?